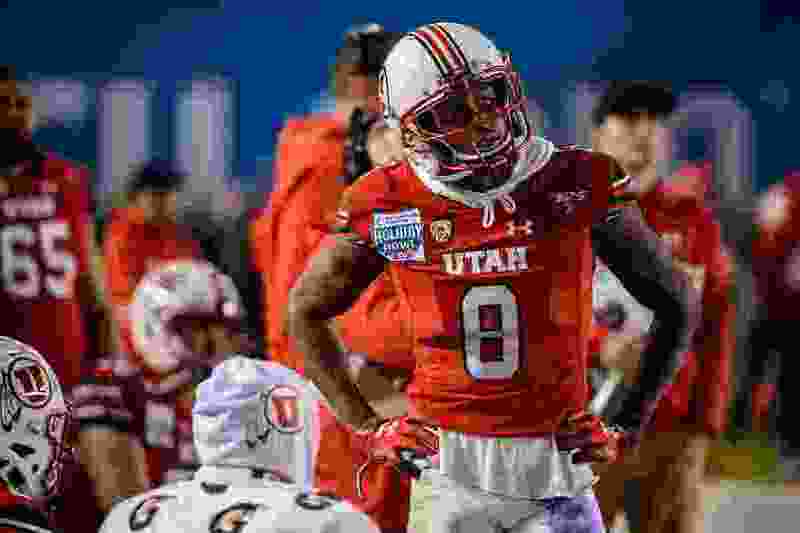 (Trent Nelson | The Salt Lake Tribune) Utah Utes wide receiver Siaosi Mariner (8) on the sideline after a turnover as the University of Utah faces Northwestern in the Holiday Bowl, NCAA football in San Diego, Calif., on Monday Dec. 31, 2018. Utah's football program staged one of the shortest Senior Night ceremonies in school history last November, when only 13 departing players were honored. This year's event would have lasted nearly three times longer, if all of the juniors from last season's roster had stayed in the program. The Utes' senior class would have consisted of 33 players, a number that's “unheard of,” coach Kyle Whittingham said Tuesday, when the Utes staged their fourth session of spring practice after returning from the school's spring break. The remaining group of 22 seniors is slightly bigger than average, bolstered by graduate transfer Manny Bowen, a linebacker from Penn State, and receiver Derrick Vickers, who was listed as a senior last year but hopes to receive another season of eligibility. Offensive tackle Johnny Capra may have become a starter, if not for his injury last August. He has given up football, along with defensive end Rex Jordan and safety Philip Afia, who would have contended for playing time in the secondary in 2019. Jackson is the biggest personnel loss, having started 12 games last season. He’s in a graduate program in finance and accepted an offer from a real estate development firm — “a tremendous opportunity professionally to take a job that was not going to wait for him,” Whittingham said. Jackson caught three passes for 33 yards and a touchdown in Utah’s Holiday Bowl loss to Northwestern and was a solid blocker. Jackson’s absence leaves sophomores Cole Fotheringham and Brant Kuithe as the primary tight ends. In a recent development, running back Armand Shyne intends to transfer, rather than play behind Zack Moss as a senior, according to Alex Markham, publisher of Ute Nation on the Rivals network. Shyne didn’t practice Tuesday, when Devonta’e Henry-Cole worked with the first team. Shyne started the last five games of 2018 after Moss was injured. He would become the 12th junior from the 2018 team to leave the Utes. After starting five games in 2018, receiver Siaosi Mariner has transferred to Utah State, along with defensive end/tight end Caleb Repp. Mariner made four receptions for 38 yards in the Holiday Bowl, responding to his rough night in the Pac-12 championship game. Mariner dropped a pass with the ball bouncing off his leg as he slid along the grass, with Washington’s Byron Murphy returning the interception 66 yards for a touchdown. Utah appears well stocked at receiver and at linebacker, where Donavan Thompson played a lot in reserve last season. Whittingham had expressed hope two weeks ago that Thompson would end up staying, but that apparently won’t happen, to the coach’s disappointment. Utah projects having 80 scholarship players in August, leaving five vacancies that potentially could be filled by transfers. Whittingham recently awarded a scholarship to senior offensive lineman Kyle Lanterman, who had persevered as a walk-on. Other walk-ons, including running back Joey Wood, who carried the ball three times last season, have left the program.